Stylish framing adds depth and detail to this distressed beige wall mirror. Introduce character to any room with this distressed wall mirror from Cooper Classics. 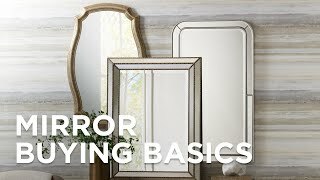 The Blevin mirror catches the eye with a shapely silhouette and a distressed beige finish with tan undertones. The frame is crafted from polyurethane and a D-ring hanger is included. 35" wide x 35" high x 1" deep. Hang weight is 13.5 lbs. Distressed beige finish with tan undertones. Polyurethane frame construction.